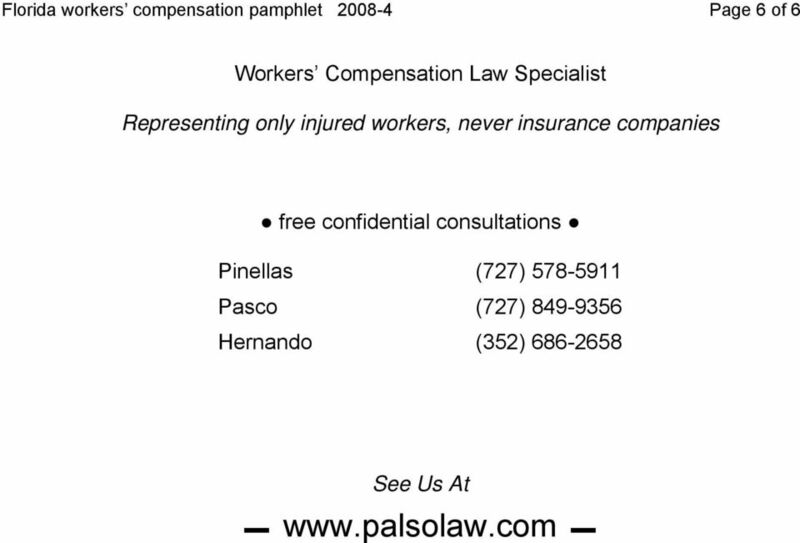 Download "Florida Workers Compensation Law A Summary For The Injured Worker"
3 Florida workers compensation pamphlet Page 3 of 6 whichever is later. 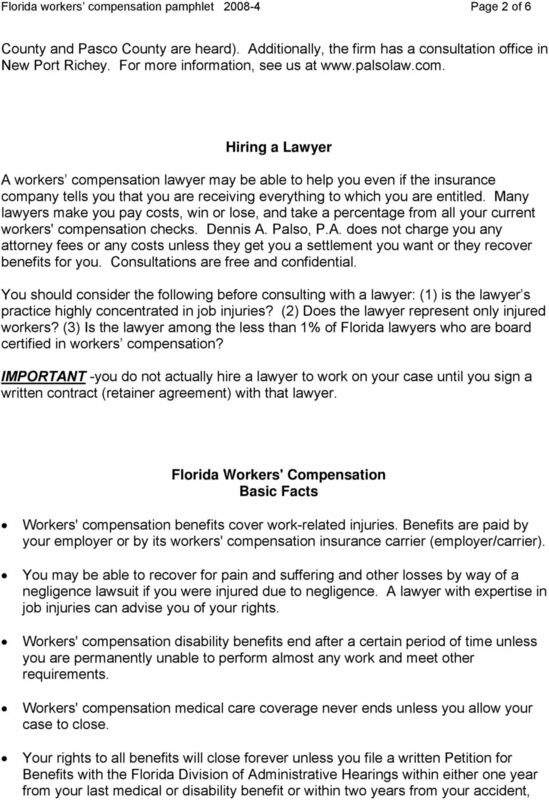 The employer or its workers' compensation carrier (employer/carrier) must provide all necessary and reasonable medical treatment such as: doctors; prescription medications; diagnostic tests such as x-rays and MRI; assistance devices such as casts and canes. The employer/carrier must provide all necessary medical care regardless of overall cost. 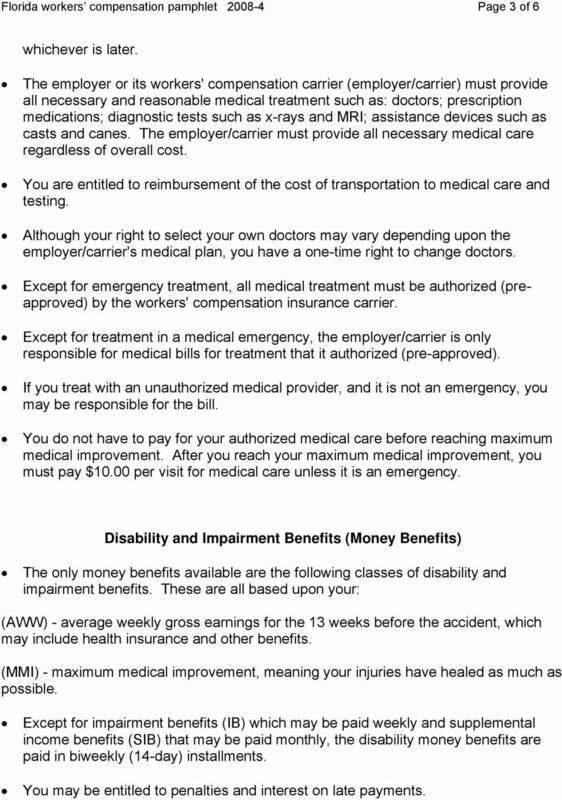 You are entitled to reimbursement of the cost of transportation to medical care and testing. Although your right to select your own doctors may vary depending upon the employer/carrier's medical plan, you have a one-time right to change doctors. Except for emergency treatment, all medical treatment must be authorized (preapproved) by the workers' compensation insurance carrier. Except for treatment in a medical emergency, the employer/carrier is only responsible for medical bills for treatment that it authorized (pre-approved). If you treat with an unauthorized medical provider, and it is not an emergency, you may be responsible for the bill. You do not have to pay for your authorized medical care before reaching maximum medical improvement. After you reach your maximum medical improvement, you must pay $10.00 per visit for medical care unless it is an emergency. 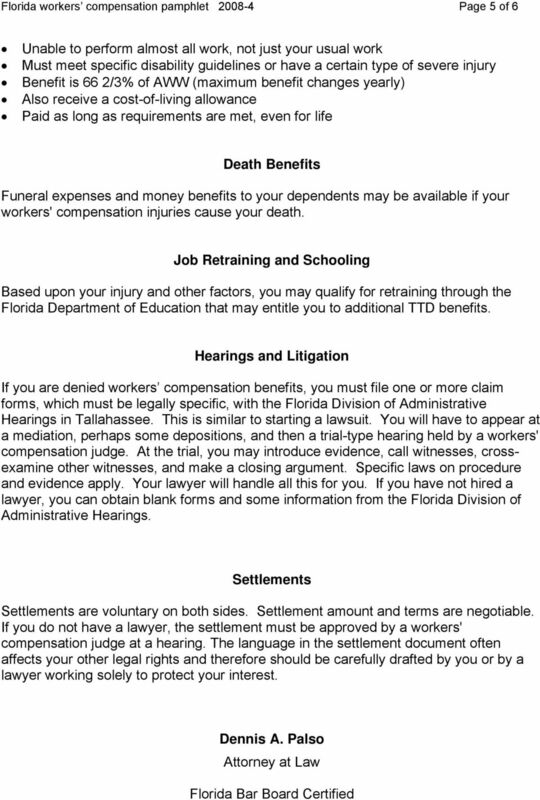 Disability and Impairment Benefits (Money Benefits) The only money benefits available are the following classes of disability and impairment benefits. These are all based upon your: (AWW) - average weekly gross earnings for the 13 weeks before the accident, which may include health insurance and other benefits. (MMI) - maximum medical improvement, meaning your injuries have healed as much as possible. 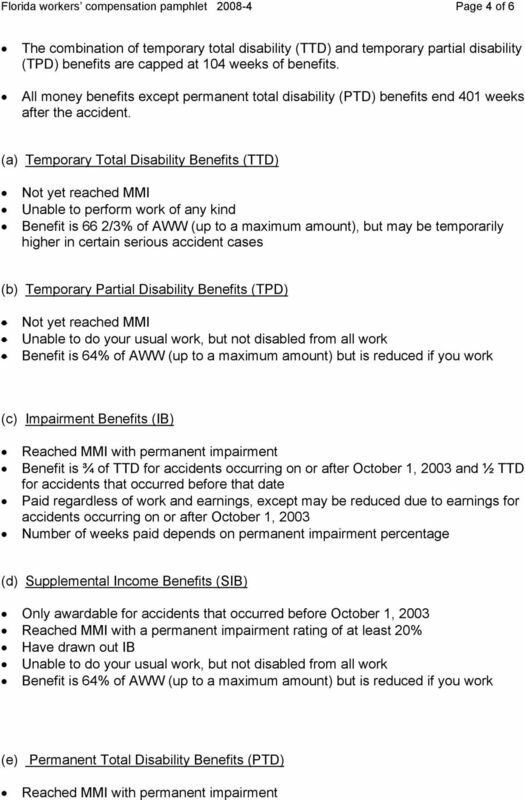 Except for impairment benefits (IB) which may be paid weekly and supplemental income benefits (SIB) that may be paid monthly, the disability money benefits are paid in biweekly (14-day) installments. You may be entitled to penalties and interest on late payments. CASE NO. 1D14-4476. 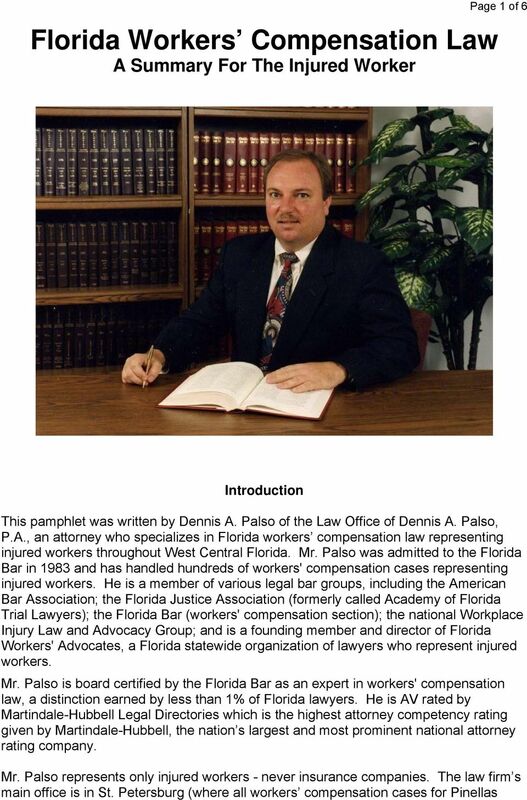 Kimberly J. Fernandes of Kelley Kronenberg, P.A., Tallahassee, and Brian S. Bartley, Fort Meyers, for Appellants.